INDIA; KUSHAN KINGS. Gadahara. Ca. 360-375 AD. Gold Dinar. PCW-I1593-INDIA; KUSHAN KINGS. Gadahara. Ca. 360-375 AD. Gold Dinar (7.82 gm; 21 mm). King standing left, wearing conical crown with nimbus, holding trident and sacrificing at altar, trident standard behind; monograms in field / Goddess Ardoksho enthroned facing. FR 44a; Cf. Göbl, Kushan 606; Donum Burns 801; Mitch ACW 3592. Sharply struck on a nice flan. Choice Superb EF. KUSHANO-SASANIAN. Vahram (Bahram) I Kushanshah. Ca. AD. 330-365. AV Dinar. Choice FDC. 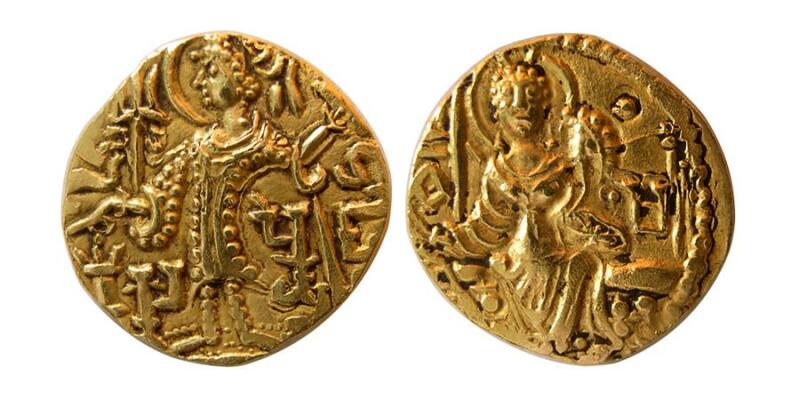 INDIA; KUSHAN KINGS. Vasudeva II. 290-310 AD. Gold Dinar. Sharply struck. INDIA; KUSHAN KINGS. Vasudeva II. Ca. 290-310 AD. Gold Dinar. FDC. Lustrous. INDIA, KUSHAN EMPIRE. Vasudeva I. Circa AD. 191-230. Gold Dinar. ANACS-MS60.